I have a group of three-year old chickens. This week I’ve introduced some new ones. I’ve done everything I can to ease their entry, including keeping them segregated but visible before letting them out into the coop. Still, the older hens are attacking and traumatizing the younger ones. Anyone who has chickens knows this ancient story. 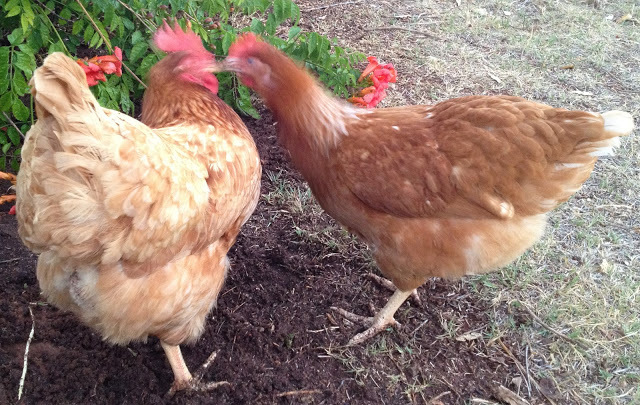 The older hens are re-establishing the “pecking order” by “hen-pecking” the new ones. It’s not that they are inherently aggressive. They’re confused because I’ve disturbed their familiar world. And here I find a parable about social relations in our demythologized world. I have been teaching and blogging for years about white privilege. Many people have praised my efforts, but I have received some negative responses. It seems that simply by raising the subject of privilege I’ve upset a certain unconscious sense of equilibrium that most white people assume – indeed, have the privilege to assume. I refer again to Robin DiAngelo’s concept of “White Fragility,” that condition when “…even a minimum amount of racial stress becomes intolerable” to white people who cannot acknowledge their privilege. Some who are “triggered” emotionally by such discussions respond in ways that are ultimately intended to reinstate their familiar sense of equilibrium. Another option is to retreat to cold, cerebral positions that recreate the same de-souled, disassociated state that caused so many of our environmental and social problems in the first place. Another person accuses me of “fundamentalism of the left” and deplores the “intellectual paucity” and “logical fallacies” of my argument. None of these people are bad persons; indeed, most of them are political liberals and/or psychologically astute. But all of them, like my older chickens, have experienced a breach in their comfort zones. Indeed, another common reaction of white fragility is to claim that one is “not feeling safe.” Can such persons imagine how black people – who fear that they could be killed by police for no reason any day – feel when a white person, in a simple, rational, even academic conversation, claims to not feel safe in their presence? DiAngelo makes it clear what’s happening: the white person’s sense of racial equilibrium has been disturbed, not any objective sense of their safety. That person is feeling uncomfortable, a natural response to the disturbance, rather than unsafe. But it is an aspect of her white privilege that she never really needs to distinguish between comfort and safety. African Americans have had to do precisely that, all day long, every day, for four hundred years. Whites who respond in these manners to the mere question of privilege are, like my older chickens claiming their pecking order, merely attempting to restore the equilibrium that existed prior to the disturbance. On the broader social and mythological levels, the same dynamic is happening, but with far more tragic implications. As I wrote (Hands up, Don’t Shoot: The Sacrifice of American Dionysus, Blogs 101-105), when the unstable mythic narratives sustaining a culture begin to break down, elements within that culture will search for scapegoats to sacrifice. The myth of American Innocence is in another period when great tears in its fabric are becoming clear to larger and larger numbers of us. How does our culture respond? By identifying – and sacrificing – the appropriate scapegoats. And no matter how or for how long our society has changed, out primary scapegoat has remained the black man. And our primary method of restoring our comfort and our sense of personal and cultural innocence – let’s call it mythological equilibrium – is to sacrifice him. Every twenty-eight hours, somewhere in America, a cop kills a black person. Forty percent of the time, the black person is unarmed. This has been true for a long time. The only difference is that now we hear about it online pretty quic... But our awareness of these crimes has not reduced their frequency. And this is because their continuing occurrence is not only a political issue; it’s a mythological one as well. Most of these cops are not bad people either, except in the sense that we all have both good and evil within us. But they work in – and for – a system that was designed long ago, deliberately, to bring out the worst in them, indeed to reward it. The old story of who we are as Americans no longer works. Almost everyone knows this. But the new story has not made itself clear to us yet. And until it does – that is, until we imagine it – the older chickens of our mad society will continue to do what they feel they have to do in order to restore that evil, racial equilibrium. And many liberals will continue to deny their privilege so as to feel comfortable again. But the newer chickens are already in the coop. Aleksandar -- What are you asking about? The American Civil War is a rather large topic (about which I have written in my book and previous blogs). Debra -- I'm afraid that your defensiveness has prevented you from hearing what I have been saying. At no point in my three blogs about white privilege have I implied that you or anyone else who has disagreed with me are racists. Indeed, I have repeatedly made it quite clear that I have not made any such accusations. But please remember one of depth psychology's most fundamental principles. When we react to someone else's comments -- or our inaccurate interpretations of those comments -- with such strong emotion, our first obligation is to consider what part of our own shadow has been triggered and why. Yes, many of our social problems are out of our control. But acknowledging our privilege and feeling the grief of being who we are in America is within our control. "In a way they do make it clear." If all 4000 of us used real photos of ourselves for our profile pics instead of Carl Jung...Carl Jung...Carl Jung...what would the Membership page look like? Do you know the races of the people who are criticizing you, and does it matter?